William Blake, the poet, painter, engraver and infamous visionary once said 'Every Eye sees differently as the Eye'*, offering his own spiritual perception of mystical experience and the power of imagination. From an early age Blake saw 'visions', 'vivid spectra' or 'flash images' which psychologists believe hark back to childhood. These were not memories, daydreams or afterimages but real sensory perceptions that haunted and inspired Blake throughout his life. These beliefs isolated Blake from his contemporaries yet he became an influential talisman for future artistic generations. To mark Blake's 250th anniversary, The Drawing Room, in collaboration with The Great Unsigned, presents Every Eye sees differently as the Eye, an exhibition of contemporary visionaries. This exhibition includes five individuals who happen to be artists and create their own highly imaginative and allegorical worlds. From differing countries and backgrounds, drawing ' manifested variously in the form of long scrolls, delicate drawings, intricate installations and light boxes ' is the favoured medium to depict their own lyrical or narrative universes. Similarly they share Blake's outlook and interest in Gothic medievalism, spiritual mysticism and outsider art movements including quasi-historical characters taken from fairy tales or mythologies. Charles Avery's ongoing epic 'Islanders' project illustrates his own vision and philosophical proposition for an imaginary island and a regular cast of characters who inhabit it. In common with Blake, Avery makes drawings and sculptural installations that display an interest in hard-lined Euclidean geometry and a philosophical realisation of the divine. Dirk Bell's drawings and photograms are strange, terrifying and mesmerising. Deeply romantic, and apparently without irony, his images are soporific and dreamlike, often reminiscent of Blake's own following of Christian theology and Gothic art. Heiko Blankenstein creates strongly linear compositions that depict natural unseen phenomena. In lightboxes and large works on paper, Blankenstein explores the cognitive principles of humanist metaphysics and systems of chaos theory. Ernesto Caivano's mural-length ink drawings depict the flora, fauna and cosmic implications of an epic love story entitled 'After the Woods'. In the narrative, the woods and characters symbolize an alternative reality informed by folklore, fairytales and contemporary technology. Kerstin Kartscher's exotic and fictional landscapes draw upon literary and political references. 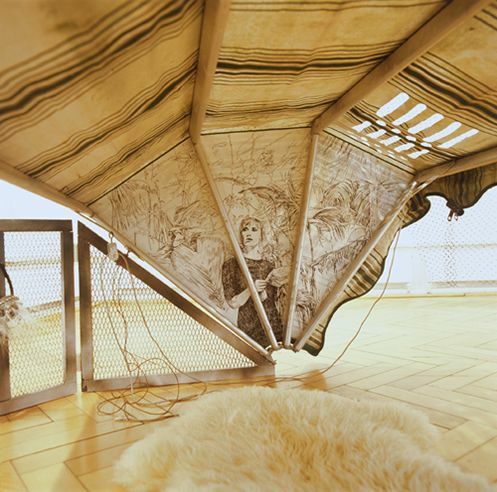 'Die Sabinerin' is a tent-like installation or shelter made from a garden awning, cage panels and netting which overhangs for privacy and protection. Kartscher draws inside of the shelter suggesting an occupant and sanctuary for the mind. *'Every Eye sees differently as the Eye ' such the object' - William Blake from 'Annotations to Reynolds's Discourses' (c.1798-1809).